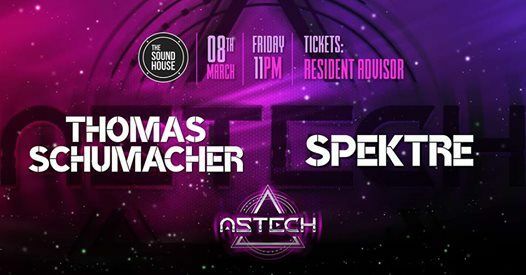 The second chapter of Astech will be a really special one with 2 respected techno producers bringing what they have best for our ears! Producing moments of pure ecstasy for the body, mind and soul! + Sarah Lennox (Day&Night Recordings) https://soundcloud.com/sarahlennox ? Thomas Schumacher was eleven years old when Depeche Mode released Construction Time Again. "I'll never forget sitting at home, listening to the album in my headphones, trying to figure out how they made those sounds." Thirty-four years later, Thomas Schumacher still burns with curiosity. The Berlin-based DJ and producer makes light of his status as one of the most enduring, versatile artists in electronic music. "What I love about Techno is that it demands that you question yourself, reinvent yourself." Thomas Schumacher is always pushing his own boundaries. "The art of being relevant," he says, "is to forget what you know.” In his early days as an artist, he had to learn how to physically create the sounds he heard in his head. Now, as a virtuoso, the challenge is to use his breadth and depth of musical knowledge to convey profound emotion. "Techno is not just a tool to make people dance," he says. "It is a very personal, intimate way of expressing myself." 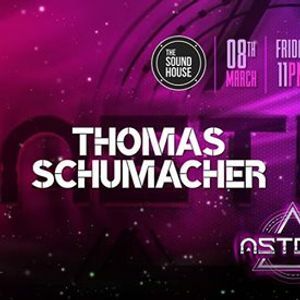 This intimacy fuels the unique vibe of a Thomas Schumacher DJ set. He compares himself to the captain of a ship. “I purposely steer my sets into rough waters. I want to help people get out of their heads and into their bodies. I create a safe space for people to lose their minds, in the best possible way. They know they don't need to worry or be afraid, because I’ve got them. I know what I'm doing. They can let go and just be." The more you do, the more there is to explore, the more opportunities to invent, connect, and imagine. "I am always the one to change it up," Thomas Schumacher grins. "My ongoing ambition is to connect to the crowd, year after year. It's what lights me up." His latest release, Natural Rhythm III on Noir Music, lit up the Beatport Techno chart, going straight to Number 1. Its highlight is "Stella", a propulsive anthem dedicated to his daughter. He sees no reason to compartmentalise his music and life. Everything is connected, everything is authentic. "There is no other version of me," he says. "When you meet me, you meet Thomas Schumacher." In 2018, they have had a near-permanent presence at the top of the Techno download charts as one of Kraftek’s core artists, with “Another Life” and their remix of “Mystery Land” both hitting Beatport’s top 3. Label boss Pleasurekraft says: "In the techno musical ocean of similar sounding mediocrity, Spektre are a shining beacon of originality; transcending hype and gimmicks, they are the real deal. Period." As performers, Spektre’s unique sound has taken them to some of the biggest and most highly regarded venues worldwide, with frequent bookings by the likes of Space Ibiza, Exit Festival, Pacha Buenos Aires and Burning Man. On stage, their long-standing chemistry and constant desire to experiment always results in an exciting spectacle. Their live exploits are also documented alongside guest slots from esteemed cohorts in their regular Mutual Respekt Podcast. Sarah is an energetic DJ/Producer from Dublin. She has releases with 69 Street Records, Playground Label & one forthcoming on Day&Night Recordings and more to come for 2019! With such experience's Sarah has travelled internationally to play in venues like Ministry of Sound/ Gigalum London/ EGG/ Sankeys Ibiza/ Hush/ Viva/ Ocean Beach Ibiza/ Places Malta. She has also supported artists such as Loco & Jam, Mind Against, Oliver Dollar, Mark Knight, Hot Since 82, Sandy Rivera (KOT), Sam Divine, Lauren Lane, Seb Fontaine, Funkagenda, Marco Loco, Koen Groeneveld, Darren Emerson, Space on Tour, Pacha on Tour & Hedkandi.